The Mission of the Idyllwild Arts Foundation is to promote and advance artistic and cultural development through education in a beautiful, natural environment conducive to positive personal growth. 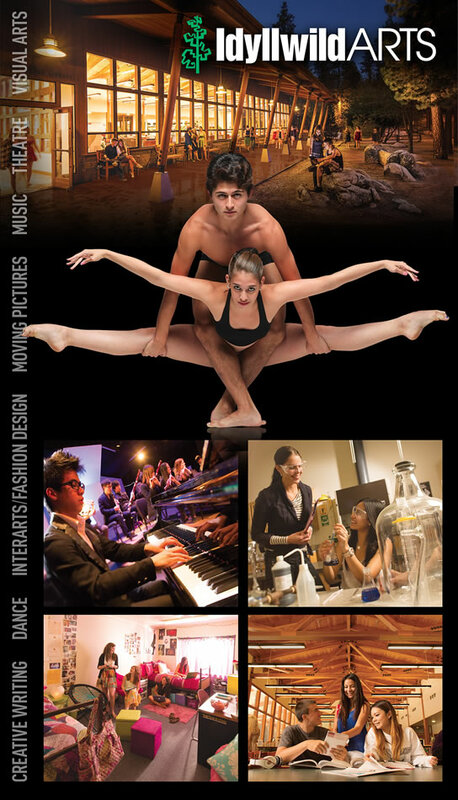 The Idyllwild Arts Academy is the country’s premier and internationally-acclaimed residential arts high school (September through May) which provides pre-professional training in the arts and a comprehensive college preparatory curriculum to a diverse student body of gifted young artists. Idyllwild Arts Academy's 300 students hail from more than 25 countries and pursue artistic excellence in Music, Theatre, Dance, Visual Art, Creative Writing, Moving Pictures, InterArts / Fashion Design. Graduates of Idyllwild Arts Academy currently excel in every professional field of the arts including Broadway theatre, primetime television, classical and jazz music, motion pictures, graphic design, photography and more. The Idyllwild Arts Summer Program provides high calibre arts instruction and memorable arts immersion workshops to a diverse student population of all ages and abilities. Nearly 2,000 children, youth, adults and families participate in the diverse summer program featuring workshops in all the arts and specifically tailored to all proficiency levels and ages. The Summer program provides children, teens, adults and professional artists intensive practical instruction in all the visual arts and performing arts – sculpture, painting, photography, ceramics, jewelry, Native American arts, moving pictures, fashion design, dance, music, theatre and creative writing.